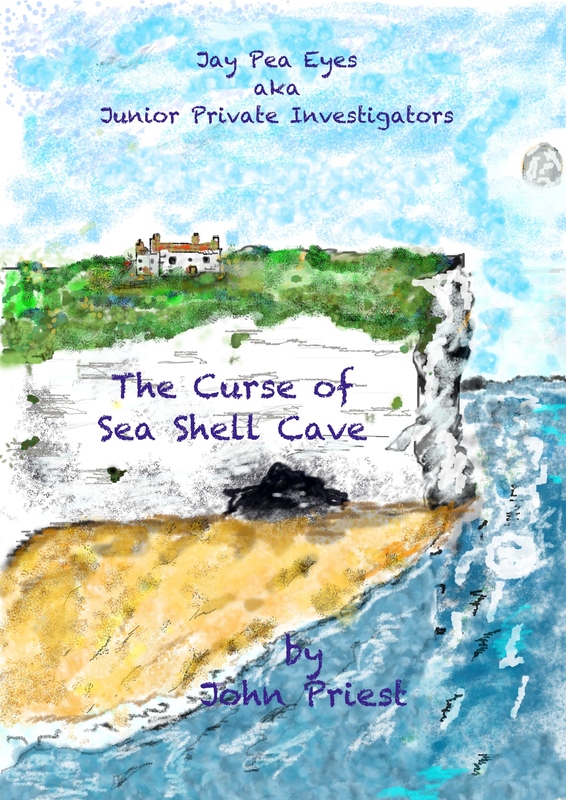 “The Curse of Sea Shell Cave” is a mystery/whodunit for children aged 9yrs. It’s the second in a detective series of The Junior Private Investigators aka Jay-Pea-Eyes (JPIs). The Junior Private Investigators are on holiday in Portsmouth, UK. The Pelican Hotel is owned by Stan’s gran Muriel Larkin and she’s great fun to be with. But not this time, this holiday is different. The JPIs sense it straight away but their parents won’t discuss it. Stan is acting strangely; he refuses to talk and locks himself in his bedroom. Muriel’s private beach is now out of bounds too. A mysterious green pigment has seeped into the sand, changing its colour. The council were closing it pending laboratory testing which they believed would show the beach to be poisonous. That meant they couldn’t explore Sea Shell Cave either. Earth tremors at night are so ferocious they rock the very foundations of the building. Muriel is distraught and thinks everything is cursed, the beach, the hotel and Sea Shell Cave. After noticing strange goings on in the hotel and on the public beach, the JPIs have a different idea on the subject. They believe something or someone is responsible and they intend to find out why. It will lead them into life-threatening danger and will be their toughest case yet. Children’s author John Alexander Priest was born in a town called Netherton in the West Midlands, UK. John is one of seven children (three girls, four boys). His latest book is The Curse of Sea Shell Cave, the second book in the popular detective/whodunit series of Jay-Pea-Eyes aka Junior Private Investigators. He started writing seriously in 1985 and had several articles published in National Magazines. His first children’s book was published by Ginn & Co, Ltd., and titled Naughty Nigel Runs Away. This was followed by Tom’s Birthday Treat and Answer The Phone Fiona! Peter Challenge – Time Surfer, a fantasy book for children. Little Miss Straight Tail is a bedtime story and is all about farm animal friends. Little Miss Straight Tail is a piglet born with a straight tail. Will it ever be curly? This entry was posted in Books, Children, Guest Posts and tagged author, book, Children, guests by P.S. Bartlett. Bookmark the permalink. Hi Peggy, thank you so much for featuring me on ‘Tonight’s Guest’, I really appreciate it!